I have several 'mad' dishes lined up to be attempted this year (there's really only six months left of 2011, how's that for time flies?) but wrapping these Cantonese dumplings was not at all planned, or thought to be possible by myself. There was no help and all I had for guidance were some vague images from a 2-hour class in Hong Kong and a couple of tips via Twitter from a fellow Hakka food lover. The class was supposed to be just for fun, as an escape to my little world of bliss while being away from my kitchen back home. The problem came after I took a bite of Dorothy's savory meat dumpling spiked with her homemade XO sauce. She had only half a dumpling to distribute among us students, I desperately wanted another half one. Pushing aside logic and reasoning, I proceeded to Twitter for help from the wonderful Sherie to get me some bamboo leaves before the Dragon Boat festival was over. So if you've quickly scrolled down to the recipe, discovered the 'Start this recipe 2 days ahead' bit, let out a snort, rolled your eyes and is slowly inching your mouse towards something less crazy elsewhere, allow me to make my case. This wouldn't be something that require three whole days to make. You could skip making the sauce and use a store bought one, but then you'd be left wondering if yours would taste better and therefore produce dumplings better than all those you've ever eaten. I mean, would you trust a commercial bottle of XO sauce to contain actual dried scallops? Once you've made peace with yourself and decided to concoct up a bottle of spicy, luxurious condiment yourself, you really can whip up the sauce and do the rest of the prep just the day before, but where's the fun in that? You'd be practically stuck in the kitchen the entire day, frying up meat, splitting egg yolks, peeling chestnuts (not a fun job) and be left with no time to savor that awesome sauce you just spent the last hour on with some hot egg noodles, boiled pasta or steaming jasmine rice. The next day you would refrain from reaching out to that inviting jar of dark red goodness pushed to the far corner of your counter top and instead try to focus on making sure that the pork, mushrooms and dried shrimps make good friends with their marinade overnight for the last thing you want is to spend hours wrestling with carefully shaping your bundles of eight treasures into leaves which seemed to have minds of their own only to end up digging into bland, boring pieces of protein. Then you get on to those chestnuts with the good ends of your nails and try not to pull your hair instead of their stubborn membranes while watching an episode of Masterchef to sweeten the process. 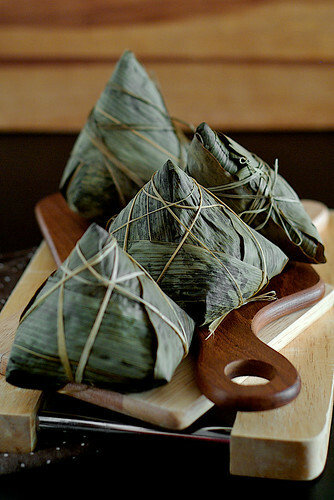 Normally at this point I would go all dramatic and tell you that come day three your blissful zen would soon be over; you would be driven close to tears, swearing and cursing knee deep under a pile of damp leaves, vowing to yourself never to bother with wrapping your own zongzi, ever again. Except this time, on a rainy Saturday morning, I got pass my first tetrahedron dumpling with a small leak and an additional leaf to patch its shortcoming. By the third dumpling I've managed to coax it into a somewhat more respectable shape with just two leaves. Congratulating myself for a rather successful virgin attempt without prior practice, I wrapped the other half of the dumplings Hong Kong style, revising what I learned from Dorothy without much incident. The incident came later while those babies were boiling. Not confident of my wrapping and tying skills, I peeked into the pot after 10 minutes to check for signs of unraveling dumpling(s), spotted some bits of rice and thought they must have leaked out of the corner of one of my less secured handiwork. I covered the pot, did the dishes and then couldn't help myself from removing the lid again. This time I saw a piece of mushroom happily dancing around in the water. That, I told myself frankly, was not a leak but a total explosion. After stressing out briefly consulting my other half with my despair, Vijay agreed that I should check that only one gave way and fix any questionable pieces before things get worse. And so the next 15 minutes was spent fishing out the dumplings for close up inspections, cleaning up the mess and putting a fresh pot of water to boil again. I think for the duration of the following two hours while the dumplings slowly bubbled away, Vijay questioned my sanity as I kept checking on them every 20 minutes or so. Alas, the slight madness produced surprisingly what he really liked, so much so that for the rest of the week he had one dumpling for dinner each day. Thank God! I wouldn't know what to do with 10 dumplings had they turned out horrible. After two was given away to his boss and one tested by yours truly, I was happy to have taken on this lost tradition not passed to me by my family. While it's unlike the dumplings we have here in Singapore and back in Malaysia, this dumpling would be something special I brought back from my travels and a proof that when you put your heart and soul into making good food, the result would rarely disappoint. 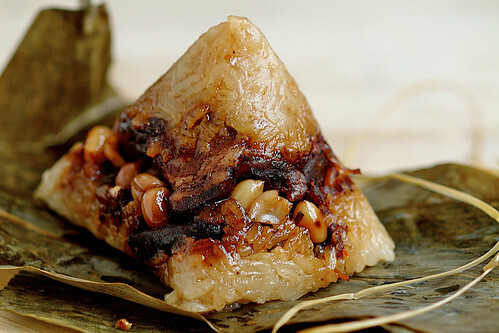 Adapted barely from Dorothy Leung's Cantonese zongzi recipe with some guidance from Joanne Khoo's beautiful Hakka Chan, for I cannot ignore my Hakka roots. Yields 20-25 dumplings, depending on size of leaves. Start this recipe 2 days ahead. Bamboo leaves: I've written this recipe to make the (usually) standard 20-25 dumplings although in this first attempt I halved my portions to wrap less. If your bamboo leaves are all uniformly big, the ingredients can be reduced to fit for 20 dumplings, otherwise err on some spares for about five dumplings. Be sure to soak/boil enough leaves for your desired recipe portion as you can put aside extra leaves to dry out but wouldn't want to be caught with insufficient leaves to finish wrapping. Pyramid shaped dumplings require 4-5 leaves each while the triangular ones use two large leaves, more in cases of any tear/leakage. Filling: The filling is best fried the day before to allow time for flavors to develop. You may have noticed I used grapeseed oil for frying the rice and peanut oil for the filling. Dorothy's advice was to use a more mildly flavored oil for the rice - I cook with peanut oil but bake with grapeseed/canola/corn oil - but I reckon if you have only one type of cooking oil it wouldn't hurt. Traditionally the peanuts are boiled or soaked in salted water till tender. We like ours crunchy with more flavor so I roasted them instead. 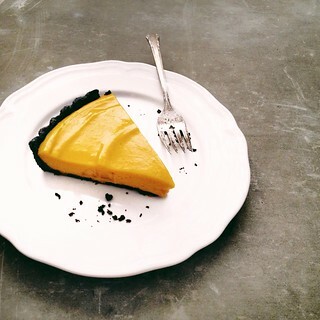 There are several schools of method in preparing the filling. Some like their filling in uniform, small pieces so the meat and mushrooms are cut up and fried together. I like my meat and mushrooms in bigger pieces so they can be eaten separately. For this you can either fry them separately with divided seasonings or fry them all together and then separate them into containers, like I did, another trick taught by my dumpling guru. Halal option: Pork belly can be replaced with beef or chicken, use the fattiest cuts available as the fat is not only essential for flavor but also keeps the dumplings moist and the rice tender while cooking. You can also mince the beef or chicken to evenly distribute the fatty bits. Shaoxing wine can be omitted or replaced with a mixture of water, sugar and vinegar. Day 1: If you're a bit crazy like me, you will be using and making your own XO sauce. Prepare this two days before making the dumplings. Caveat: Refrain from consuming too much of the sauce on this day else you would realize there's too little left for your huge dumpling project. Soak the dried mushrooms and chestnuts overnight. Day 2: This will be the day of filling frying and prepping of all ingredients. I like to get everything ready on this day for less stress on dumpling day. 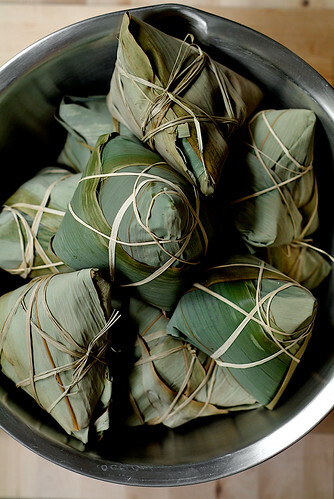 Soak the glutinous rice, bamboo leaves and grass strings overnight. Drain the mushrooms completely and cut bigger pieces into half. Drain and peel the chestnuts. Half the salted egg yolks. Cut the pork belly into pieces about 1-centimeter thick, each piece with layers of skin, fat and meat intact. In a small bowl, mix all the seasoning ingredients for frying the filling except the oils. In a large wok or frying pan, heat the oil for frying the filling. On medium high heat, add the mushroom and sauté for about one minute. Add in the dried shrimps and toss for another minute. Add in the pork belly. Reduce heat to medium and add in the seasoning mixture. Fry for about 2 minutes, mixing well to coat. Add in the sesame oil, give it another toss and remove to a heatproof bowl. With a pair of chopsticks, separate the mushrooms and pork pieces into two containers, with bits of dried shrimp divided in each. Store all prepped ingredients (egg yolks, chestnuts, mushrooms, meat) in the fridge till needed. Day 3: On the big day, start by roasting the peanuts and set aside to cool (if boiling/brining instead, you can do this the day before). In a large wok or heavy saucepan on medium low heat, fry the sliced shallots with the peanut oil till golden brown. Remove the shallots onto a piece of kitchen paper and set aside, leaving about 1 1/2 tablespoons of the shallot oil in the wok/pan. Reduce heat to low and add in the rice. Toss briefly to coat and add in the XO sauce oil. Add the in rest of the seasonings and toss quickly just to mix well. Remove the rice into a heatproof bowl and allow to cool for at least 15 minutes. Meanwhile wash the bamboo leaves, drain them and cut off the rigid end of the stems with a pair of kitchen scissors. Set out the grass strings to ensure easy access with no tangles. 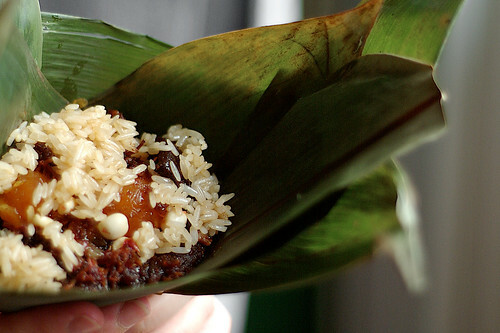 Arrange rice, leaves, strings and the rest of the filling ingredients to prepare for wrapping. 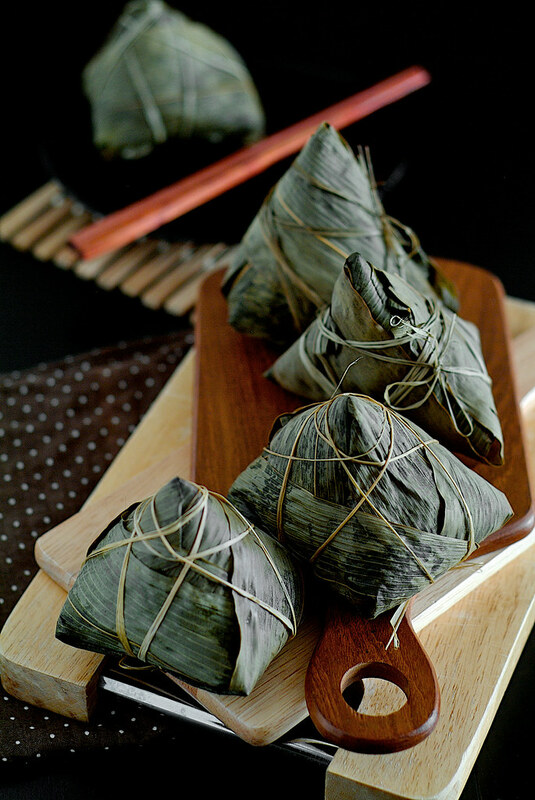 To wrap the Malaysian/Singaporean style triangular dumpling, layer two bamboo leaves in your palm, smooth side up. Form a cone using the top end of the leaves, making sure the tip of the cone is sealed well. Add in two tablespoons of rice. Layer the rest of the filling ingredients as desired, then top with additional two to three tablespoons rice until the cone is almost full. Press down the rice and filling firmly. Fold the remaining part of the leaves over the top of the cone and wrap tightly around the dumpling (photo guide here by Reese of Season with Spice and video here, thanks to Lisa H. of From My Lemony Kitchen, check out her pretty Nyonya version!). Tie a piece of grass string around it snugly, making sure the dumpling stays in one piece while boiling. 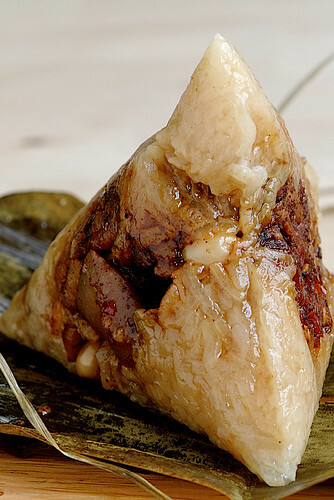 To wrap the Hong Kong style pyramid shaped dumpling, hold a piece of leave on each hand and overlay them to form a cone with the middle part of the leaves, making sure the tip of the cone is sealed well. Add in two tablespoons of rice. Layer the rest of the filling ingredients as desired, then top with additional two to three tablespoons rice, pressing down the rice and ingredients tightly until the cone is full to the brim. Add a piece of leave on each side of the cone, keeping the ends aligned and with about 3 cms of overlay from the brim of the filling. Holding the cone snug with both hands, push down the overlay on the left and right sides with your thumbs, making sure the rice is covered at this point. Fold up the bottom and top ends of the overlaying leaves to seal, forming a rectangular or square dumpling base. Cut off the extra bit of leaves jutting out of the dumpling base if required. To tie, place the half length point of a piece of grass string at the pyramid base. Loop one end of the string around the top of the pyramid, repeat on the opposite side. Twist the string where they meet at the pyramid base to switch direction 90 degrees and repeat the looping to complete the four sides. Knot at the base of the pyramid to secure. Check out the video here, though the tying method is different. To cook the dumplings, bring a large pot of water (enough to cover all the dumplings) to a boil. Reduce the flame to medium. Place the wrapped dumplings into the water, making sure all of them are fully submerged. Cook covered for 2 hours. 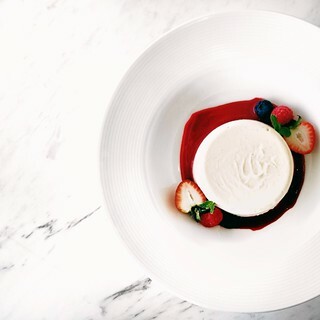 Remove and drain completely before unwrapping to serve. If you have a pressure cooker then boil for approximately 30 to 40 minutes on pressure, then depressurize naturally. Wrapped and cooled dumplings can keep for up to two weeks in the fridge or a month in the freezer, just steam them for 15 minutes to reheat. anh: They're hardly pro, especially the tetrahedron ones. You should try a small batch come dumpling season, maybe with some Vietnamese flavors like your recent xôi sắn/ xôi khoai mì which I love. the question is, will you be doing this again? 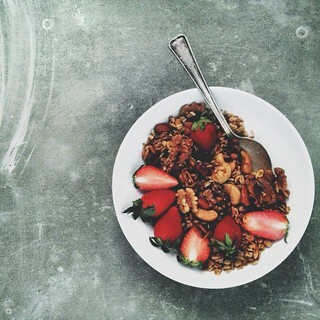 Lisa: While it looks lengthy, each day I only spend a couple of hours in the kitchen and relaxed the rest of the day. It's not so bad as long as you don't cram everything into one day. If your hubby can wrap such pretty changs you can surely do it too! Lan: The answer is yes, the question is I'm not sure when I'll do it again. As long as there are takers for them I think I'll be motivated. Bravo for your attempt! Very impressive indeed! And you've got beautiful photos to show them off... Life is great! You know, you will need to do this a few more times otherwise you will lose the feel for it! I feel that it's also easier to wrap this way, since you only have to wrap around its middle. Shirley: I agree, practice makes perfect. In fact I felt more comfortable as I went along after wrapping 2-3 dumplings of each style. 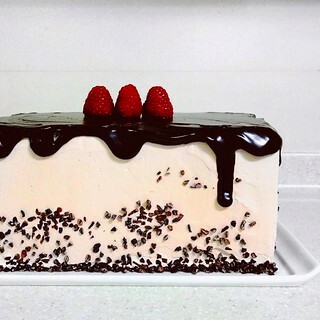 If you want some I'll be encouraged to make another batch. grapejelly: Glad you read on. I actually made both styles, the tetrahedron one like you mentioned was a bit out of shape as I forgot to pinch the base when sealing the dumpling. Some of them were also patched with a third leaf. I wouldn't say the HK style is for beginners as all the dumplings I see sold there are shaped such. The advantange of this shape is that it holds more filling so you can make a really scrumptious dumpling. Wow. I have a list of mad dishes too but I have a feeling your mad dishes are more mad than mine are LOL. These look amazing. I love it when food is tricky!! Sherie: Thanks for getting me the leaves, without them this wouldn't be possible! Wow Pick Yin, your food and photography have gone from super to superb! Was browsing through the past few posts and your styling is really impressive. Well done!!! Ju: Thanks dear, am always trying to improve. Welcome back! Xiaolu: Here we have savory ones which are purely vegetarian and I hear they can be quite delicious. I had fun photographing the wrapped ones. Can't get the opened ones to look the way I wanted though. Hi Pickyin, thanks for the recipe. 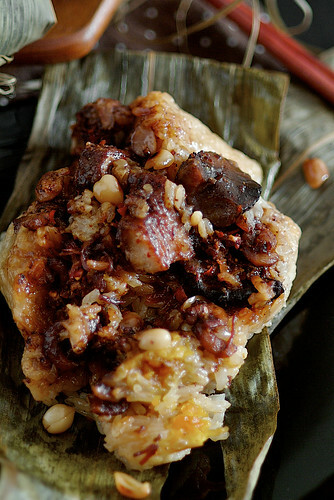 Do you add the fried shallot and the XO sauce into the pork filling during the wrapping? Maureen: I was greedy. Vijay said the dumpling too little rice! This year no more wrapping, too much work and no one to help! Anon: The XO sauce and shallots are added during the wrapping. I made the dumplings today. Though I have to improve on my Nonya style wrapping (supposedly the easiest of all versions, but I still think was quite complicated), the little triangular darlings tasted better than the ones we bought from Chinatown. Great recipe, Pick Yin!! Thanks so much for posting. 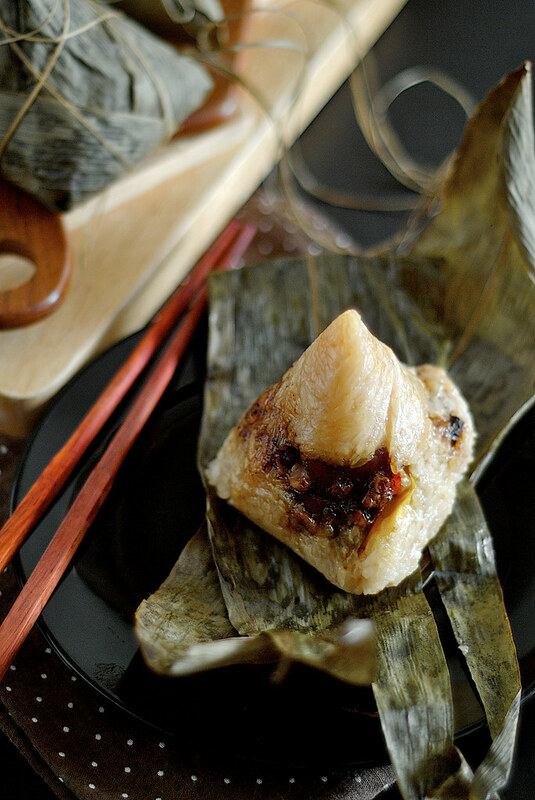 Great-looking zongzi! 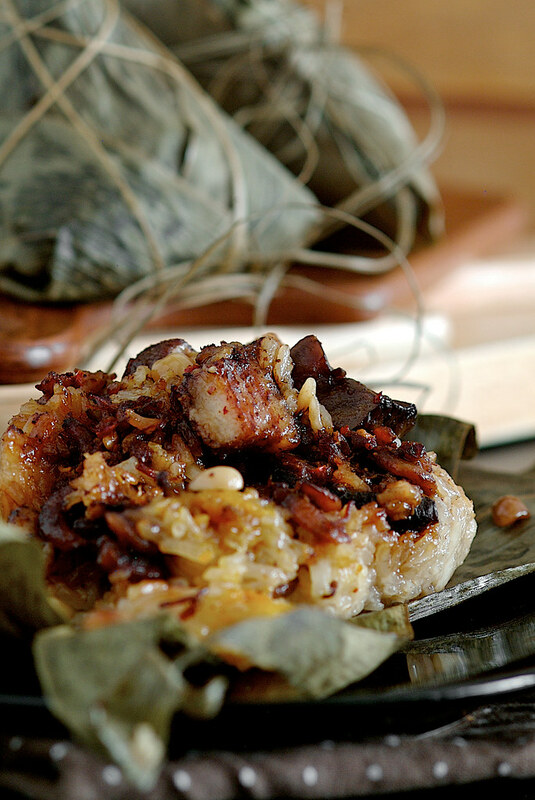 Have you eaten plain roasted peanut zongzi? My childhood memories of these small, pillow-shaped delights in Kota Kinabalu, Malaysia, are driving me crazy, and I would like to know what else goes inside those bundles aside from peanuts, soy sauce, and brown sugar. Garlic? 5-spice? May I ask where you took the sticky rice cooking class? Hi Cherry, sorry for the late reply. I took the lesson at City Super. They provide regular cooking classes. Visit their website for more information. Your dumplings look awesome! 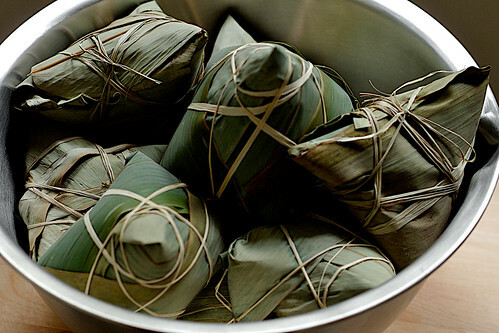 Somehow I always thought banana leaves were used for wrapping the dumplings. I'll have to ask at the Vietnamese grocery I go to if they have bamboo leaves. The tiny shop is packed with every conceivable food supply there is. Not an inch of space is wasted so I'm sure they'll have something I can use (or I hope so)!